As someone who handles razor-sharp knives on a day-to-day basis, I’ve been cut on the rare occasion (nothing seriously mind you), so when the founder of NoCry Cut Resistant Gloves reached out for a review, I was intrigued. They sent me three pairs to try out and here’s what I thought. If you’re a casual knife user, you might be wondering why anyone would need cut-resistant gloves. I thought the same until I met my wife. She’s a very competent and dexterous person, but when it comes to knives and food preparation, she’s a mess. It started when she cut herself with a peeler a few times and grew worse after she sliced her finger chopping a sweet potato. Since then, she refuses to peel anything for fear of cutting herself. Her confidence is shot. The NoCry Cut Resistant Gloves are the perfect solution for people like her. These gloves allow her to slice, dice, and peel without the fear of mixing blood and gore in with her famous homemade chili. Aside from the typical use of holding items while cutting to increase confidence, NoCry Gloves also assist in a few other tasks. The folks at NoCry let me know that a large majority (around 80%) of people who bought the gloves use them in the kitchen. 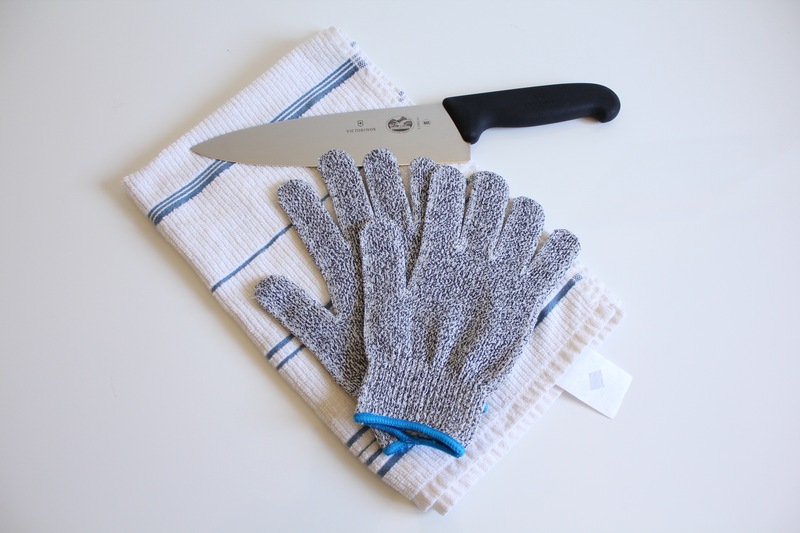 Ideal kitchen use for cut-resistant gloves is peeling, dicing, shucking oysters, grating cheese, or trying to cut a whole watermelon in 30 seconds or less. 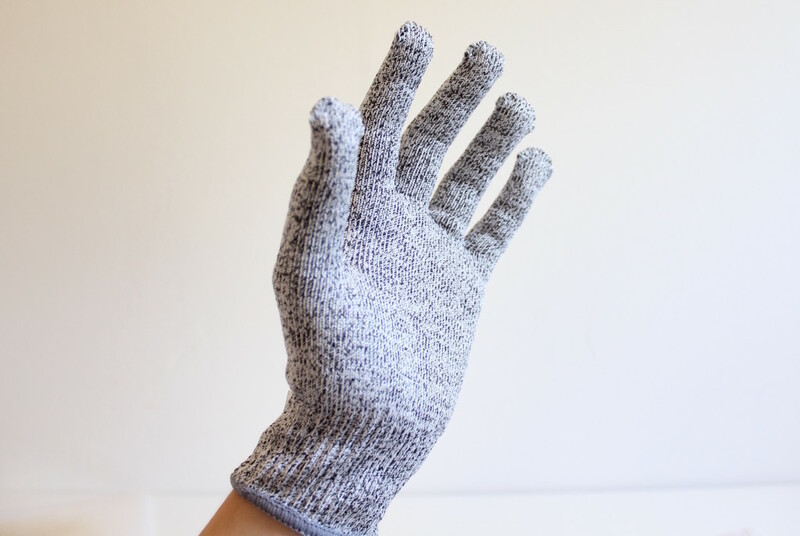 Although I don’t have a mandoline slicer, many of the reviews on Amazon say that the gloves can also save a trip to the hospital. The other 20% of users for these gloves are hunters and fishers. When you’re dealing with sharp knives in wet and slippery environments (filleting a carp or skinning a white-tailed deer), your hands become prone to slippage. Enough background—let’s dive right in. The gloves arrived in a nondescript, resealable zippered plastic bag. Packed with the gloves were a proof-of-purchase slip and a print-out of some general instructions/care tips. You can tell NoCry is a fairly small operation from the packaging, and that’s not a bad thing. When it comes to marketing and branding, no company has done a better job the past few years than Taylor Brands LLC. With the help of Taylor Brands, Schrade has come roaring back from the grave with a slew of fantastic survival knives, including the Schrade SCHF38 Frontier, Schrade SCHF27 Extreme Survival, and Schrade SCHF9 Extreme Survival. While much of the recent focus on Schrade has been with these badass fixed-blade knives, it’s the simpler folders that are getting the short end of the stick. 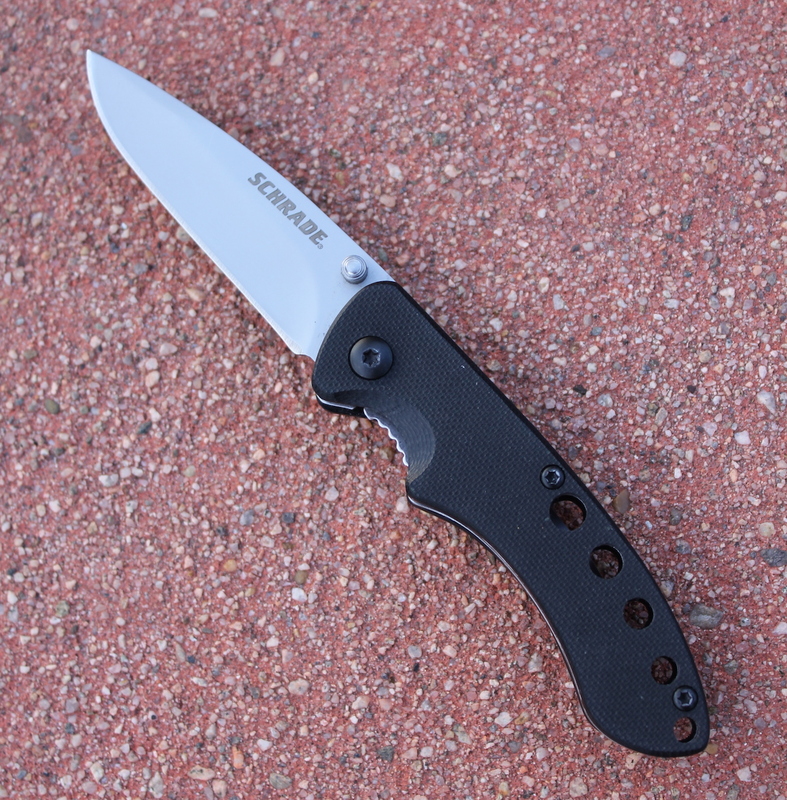 So we’ve decided to review the Schrade SCH107 Folder. Before getting the knife, I had no qualms about its overall purpose. This is in no way a survival knife or even a folder designed for heavy-duty tasks. With those presumptions in place, the SCH107 undoubtedly met my expectations. After carrying around the larger Spyderco Tenacious as my everyday carry for a while, the SCH107 felt smaller in the hand. That’s not necessarily a bad thing either. When engaged, the knife has an overall length of only 6 inches but fits my hand surprisingly well. The design of the knife is nothing spectacular, but that’s not why this knife is so compelling. It seems well-made and perfectly adept at tackling some of the mundane tasks you’d encounter around the house. Let’s take a closer look at some of the knife’s components. The blade is 2.5 inches long with a bead-blasted finish, which removes the reflective properties of the steel. Many laws restrict carrying knives that are longer than 2.5 inches, so it has the added benefit of being legal in many places. You’ll still want to double-check the laws in your area. 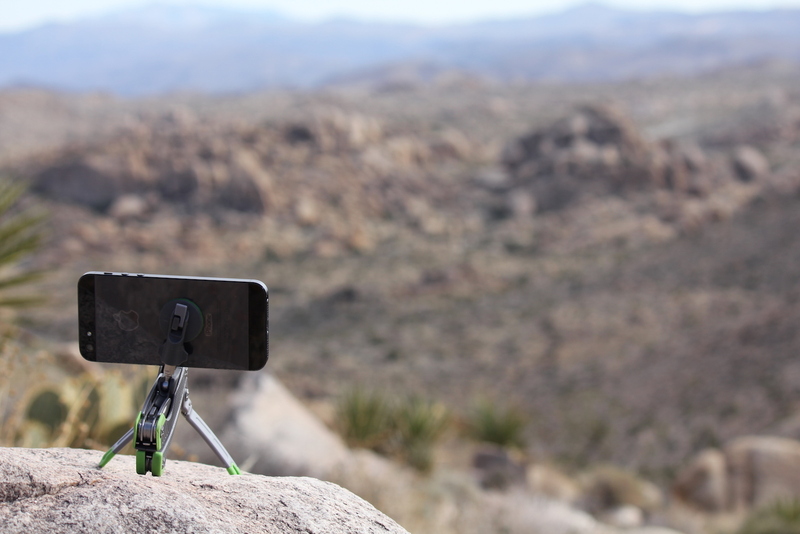 Back in 2012, Gerber released a product that appealed to the amateur photographer and smartphone demographic by having a tripod built in to a regular multi-tool. I received this from Gerber a while back as a thank you for helping them with an event in New York City, so I finally decided to try it out. Here’s my review of the Gerber Steady Tool. After handling various Leatherman multi-tools, the first thing that jumped out to me was the look and feel of the body. Unlike the full metal bodies of other plier multi-tools, the Steady Tool features a plastic body that offers more grip but also feels a bit different in the hand. The construction of the tool seems solid and well put together, with nothing being overly loose. The tools, on the other hand, might be a little too tight. Pulling out some of the screwdrivers is extremely difficult (we’ll talk more about this later). Since the obvious person this is marketed to is the weekend adventurer, I took it along on a trip to Joshua Tree. Normally, it’d begin with a look at the actual knives and tools of the product, but because the tripod is the key feature of this multi-tool, that’s where we’ll start. To engage the tripod, you pull out two legs from the handle while the other side of the handle acts as a third leg to balance the camera. A screw-in mount must be pulled up to give you something to put the camera on. I’ve been looking for a new EDC to carry out basic everyday tasks like opening packages, removing tags, pretty simple things. I knew I wanted a mid-sized Spyderco knife that had a reasonable price, so I went for the Spyderco Tenacious. With an overall length of 7.76 inches and a weight of 4.1 ounces, I found this knife a bit larger yet lighter than expected. The construction on this knife is nice and tight. There is no blade play whatsoever. I’ve heard some complaints about the Tenacious being difficult to open, but the blade on this knife engages smoothly and effortlessly with a nice snap. The blade is 3.39 inches long and .118 inches thick. 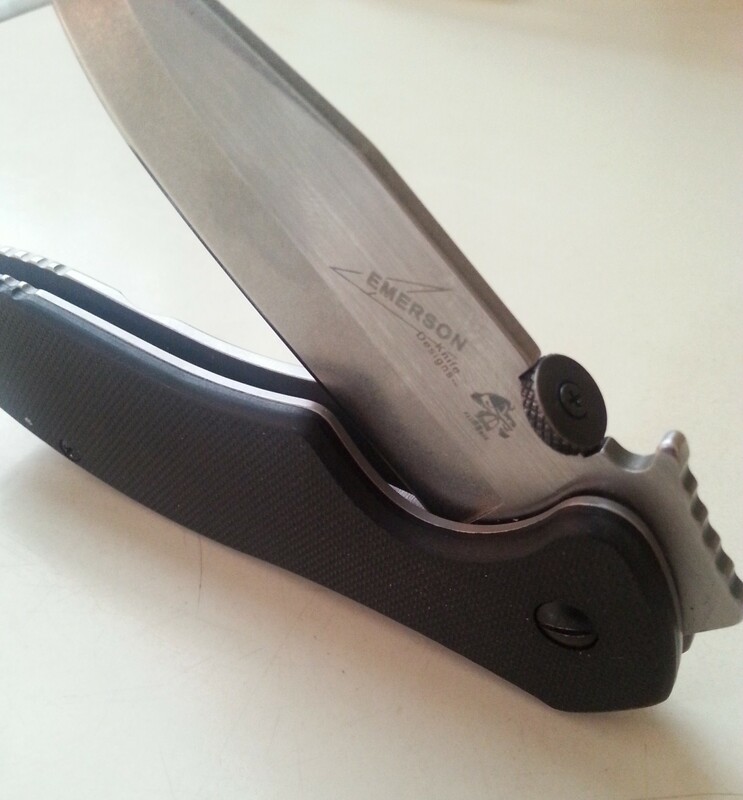 It’s a good blade thickness for more nuanced jobs, but there is added strength from the thicker spine. There is also some nice jimping—small indentations at the bottom of the spine—which gives better control. The blade has a flat grind leaf shape and a good-sized belly for efficient slicing. 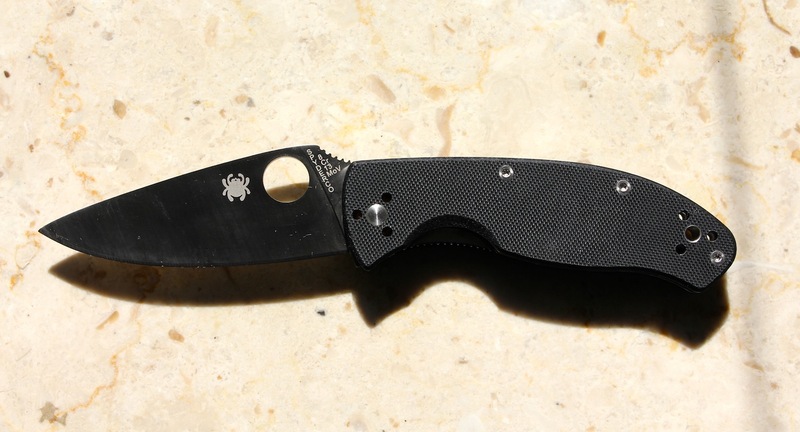 Some other features on the blade include two Spyderco notables. The first is the recognizable Spyderco logo, which is nicely etched into the blade. 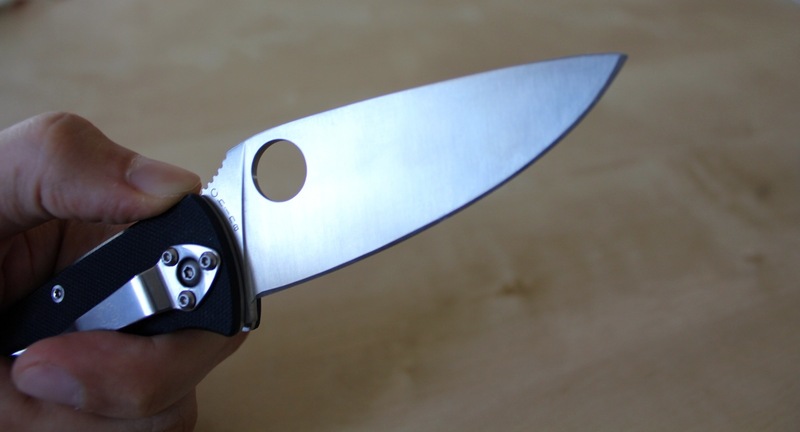 The other is Spyderco’s trademark round hole that takes the place of the thumb stub. Some people complain about it, but I find the hole comfortable and perfectly placed. It allows for easy one-handed opening without putting pressure on one point of your thumb.